These JHM Oil Change Kits come with everything you need to change the oil in your B6/B7 S4 and C5-allroad 4.2l V8. You save money too! What's included? 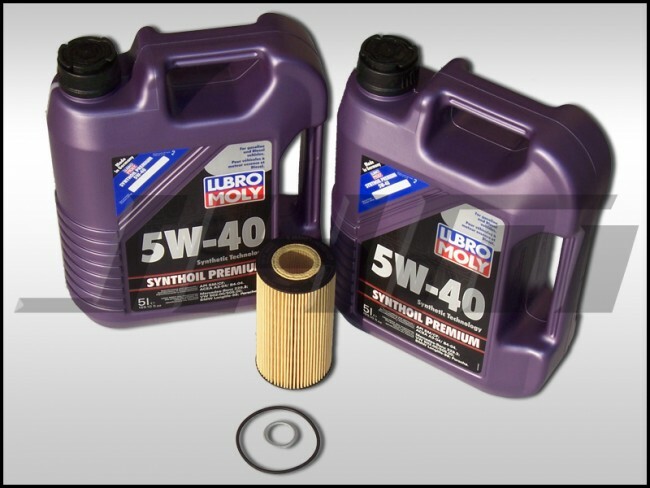 10 - Liters of 5w40 Lubro Moly Synthetic oil (same oil we use in our 2005 S4 that we use to test all our products and abuse it at the track frequently, so we know it is great oil), 1 - Hengst-OEM or MANN Oil Filter (select from drop down box below) and 1 OEM oil drain plug O-ring. The B6/B7 S4 V8 takes 9.5 quarts (9 liters) of oil but we supply 10 liters in this kit. Why? The B6/B7 S4 all aluminum motors are known for a small amount of oil consumption, this way you will have a spare liter left to help make it to the next oil change.